Are you tired of being unhappy with your skin? Looking for different ways to get rid of enlarged pores, discoloration or skin flaws as a result of the aging process? More than likely, you have said yes to one of these issues, currently or in the past. No one wants to deal with troublesome skin, especially if it leaves you feeling less attractive when you look in the mirror. All of us have tried dozens, maybe hundreds of different products that claim they can help us. In the end, we are stuck with a confusing washing regimen that consists of at least four to six different products. What if we told you we know of a single product that can deal with all of these problems? Nerium is a revolutionary new anti-aging product that can help you be more confident and comfortable in your own skin once more! So, what makes Nerium so different from every other product on the market? It is a nighttime cream, developed using the company's patent pending extract made from the Oleander plant. By using this and other high quality ingredients, NeriumAD nourishes your skin and eliminates problem areas, allowing you to feel more confident. To learn more about NeriumAD and all of its amazing properties, make sure to check out the Amazing Skin Care Blog. Here, you will see how this product has helped real women, just like you and me, build confidence once again in their skin! Want to try NeriumAD for yourself? If so, we have the perfect giveaway for you! We are working with the Amazing Skin Care Blog - a Nerium Partner - to bring you this awesome giveaway. One lucky reader will have the chance to try a full size bottle of NeriumAD in their own home. Before entering, make sure to read the rules below and then enter through the Rafflecopter. 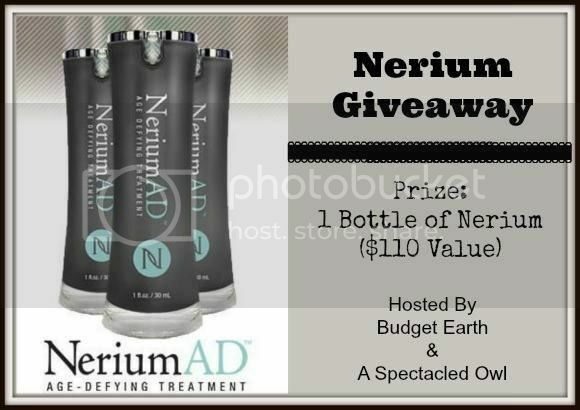 1 Readers will receive a bottle of NeriumAD ($110 value). Giveaway ends July 31st at 11:59pm. Budget Earth, A Spectacled Owl, & other participating blogs are not responsible for prize fulfillment or shipment. Disclosure: Simply Me did not receive compensation for this giveaway. Facebook, Twitter, & Pinterest are in no way associated with this giveaway. Prize fulfillment and shipping will be handled by Amazing Skin Care Blog.